Rescue excavations between 1969 and 1976 at the Breiddin hillfort, Powys, although covering only a small part of the site's 28 ha, showed that small-scale or sporadic activity in the Mesolithic and late Neolithic/early Bronze Age was followed by a substantial occupation towards the end of the Bronze Age, with a timber-framed rampart yielding radiocarbon dates centred around 800 bc. After a period during which the hilltop was probably used for little more than grazing, the rampart was rebuilt on a larger scale, probably in or about the 3rd century bc; an outer line of defence may date from about this period but a third rampart seems more likely to be later. There was nothing to demonstrate whether the Iron Age occupation persisted into the 1st century AD, and early Roman material was absent. Pottery and coins showed that occupation, perhaps of an essentially agricultural nature, began again in the 2nd or early 3rd century AD and continued until the end of the Roman period, if not later. The excavations produced an important collection of late Bronze Age pottery and metalwork, though few structures within the hillfort could be attributed to this period. By contrast, the Iron Age occupation left evidence for numerous circular and rectangular buildings, but there were relatively few associated finds. 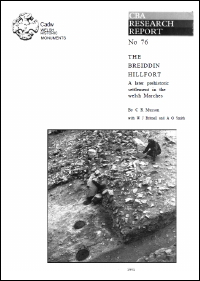 The hilltop's environmental history from the Late-Glacial to the beginning of the Iron Age occupation is described through the study of waterlogged deposits from a pond within the hillfort; also recovered from the pond is an important collection of wooden artefacts, the majority of them dating to about 300 bc.